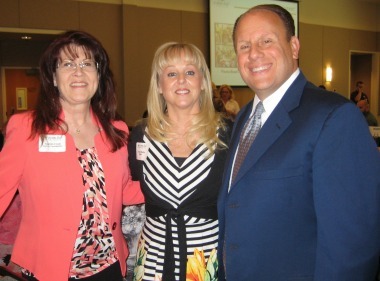 Pictured above are Tammi Crum from the Helios Foundation and LeAnn and Trey Basha. This year’s Board, Donor & Volunteer Luncheon welcomed the dedicated supporters of A New Leaf for a special afternoon of recognition and celebration. The event was held at the East Valley Institute of Technology’s Culinary Arts Program and celebrated “Seeds of Kindness” – the volunteer service and financial and in-kind contributions made by A New Leaf’s dedicated supporters. Mike Hutchinson, Board Chair, Michael Hughes, CEO, and Torrie Taj, Deputy CEO, hosted the event and spoke of the precious commitment of our partners to serve those in need, and expressed their appreciation for the generosity of A New Leaf’s supporters, donors and volunteers. Words cannot begin to say how much we appreciate our agency's generous volunteers and donors. We salute you, and look forward to working with you in months to come!